Dia 15 de outubro de 2018, às 14h30, tem lugar na sala 250 da Faculdade de Psicologia e de Ciências da Educação da Universidade do Porto (FPCEUP), a Conferência Internacional "What can we learn about human behavior from the air: atmospheric chemistry studies from a football match and a movie theatre?". Esta sessão vai ser dinamizada pelo Prof. Jonathan Williams com entrada livre e gratuíta. 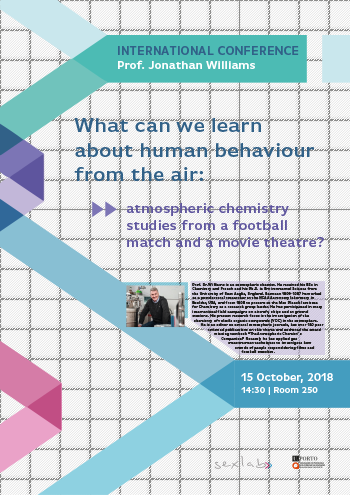 Title: What can we learn about human behaviour from the air: atmospheric chemistry studies from a football match and a movie theatre? Abstract: Current technology allows hundreds of volatile trace gases in air to be measured every second at extremely low levels (parts per trillion). These instruments are often used in atmospheric research on planes and ships and even in the Amazon rainforest. Recently, we have used this technology to examine air composition changes caused by large groups of people (10 000-30 000) under real world conditions at a football match and in a movie theater. In both cases the trace gas signatures measured in ambient air are shown to reflect crowd behavior. By applying advanced data mining techniques we have shown that groups of people reproducibly respond to certain emotional stimuli (e.g. suspense and comedy) by exhaling specific trace gases. The consequences of the findings and possible applications to market research, the rating of films and human sexuality will be discussed. Prof. Dr. Williams is an atmospheric chemist. He received his BSc in Chemistry and French and his Ph.D. in Environmental Science from the University of East Anglia, England. Between 1995-1997 he worked as a postdoctoral researcher at the NOAA Aeronomy laboratory in Boulder, USA, and from 1998 to present at the Max Planck Institute for Chemistry as a research group leader. He has participated in many international field campaigns on aircraft, ships and at ground stations. His present research focus is the investigation of the chemistry of volatile organic compounds (VOC) in the atmosphere. He is an editor on several atmospheric journals, has over 180 peer reviewed publications on this theme and authored the award winning textbook “The Atmospheric Chemist´s Companion.” Recently he has applied gas measurement techniques to investigate how crowds of people respond during films and football matches.